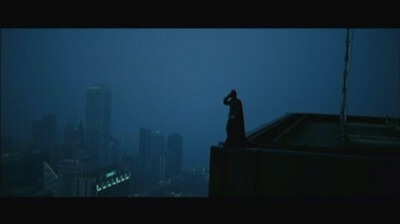 Three years ago, Christopher Nolan assembled a well-written, exciting, and beautifully photographed film about how a spoon-fed millionaire could become a protector of injustice -- while dressed up as an oversized bat. Paired with a phenomenal cast, including a bizarrely perfect choice in Christian Bale to fill some rather difficult boots, Batman Begins arose as a sensation among a diverse audience. Little did moviegoers know that Begins was an exercise in acclimation for the brilliance to come. Note: Photos in this review were taken from the Sneak Peek Dark Knight disc included in the recent Batman Begins Gift Set. Where Batman Begins was the director's opportunity to step into the sandbox and grow to know the Batman character, The Dark Knight transforms the earth underneath the first film into a majestic castle of Camelot-sized proportions. Nolan's masterwork is one of the strongest, if not the strongest, crime dramas of the past ten years, and easily one of the more important films to be crafted within the post-9/11 era. And yes, I'm still talking about a film where the protagonist slips through the shadows in the middle of the night adorning a cape, cowl, and toolbelt. 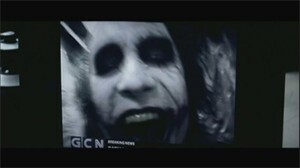 It also resurrects the iconic persona of a psychotic clown, self-diagnosed as an "agent of chaos", but that's to come. When it all boils down to the bones of the matter, The Dark Knight comes out of the gate with a shockingly straightforward concept. Batman's efforts to clean up the city has spurned further crime activity, much like scratching a rash for temporarily relief with the knowledge that the sensation will get worse until the problem goes away. He has also spiked citizen confusion, as his efforts have been seen as equally destructive to their helpfulness. To combat this ill will towards a vigilante's efforts, a naturally radiant figure, Harvey Dent (Aaron Eckhart, Thank You For Smoking), has stood in his place to become the pure public "hero". 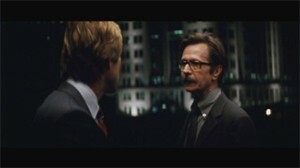 He wants the same things as Batman, which helps in his difficult dealings with Ltd. Jim Gordon (Gary Oldman, Leon the Professional) and the Gotham City Police Department. In a world full of villainy and backstabbing, Batman and Bruce Wayne can still rely on two individuals to stay headstrong -- his butler Alfred (Michael Caine, Sleuth) and his tech research liaison Lucius Fox (Morgan Freeman, Se7en). Surprisingly, Batman's presence in the film takes a drastic step back into the shadows. He becomes an ethereal figure, somewhat omnipresent in every scene but lacking the spotlight. Some comic book fiends might not enjoy the lack of direct face time with the character, but it suits the politically-driven and almost anarchistic demeanor that the streets and skyscrapers of Gotham take on in this new chapter. As usual, Bale is phenomenal as both Wayne and as the snarling, fraught Batman. 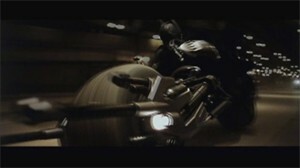 Growling and all, Bale lets himself get consumed in the role as the city's avenger. Instead of the film's focal hero, Eckhart's Dent and Oldman's Gordon take up the spotlight that the unambiguous bright-side of the law requires, both formulating each character with enough gravitas and fluency to nearly steal the show from underneath Batman. The Dark Knight, both the character and the film, gets its gritty hands drenched in filthy themes revolving around terrorism, natural chaos, and morality at play within the crumbling metropolis of Gotham. Herein lies where the complexity starts to arise inside of a rather simple narrative. It's a scary film, primarily because of how much Gotham mirrors how a terrorized city would react from the inside out amid an attack. Evacuations and explosive panic aside, this raw nature of a city consuming itself while in the midst of conflicting moral dilemmas is a stroke of sheer, horrifying genius. Director Nolan wrangles together some really unique and disturbing ideas for his second entry into his Batman universe -- though now it seems like this "universe" integrates more into the natural culture of Chicago with how organic both films have felt -- and handed them over to his brother, screenwriter Jonathan "Jonah" Nolan. It seems like Christopher wanted to have a Batman expert help him in writing the first Batman film, especially since it would be formulating / reprogramming our notions of Batman and Bruce Wayne for the new franchise, which ushers in producer and writer David S. Goyer. With his second film, Nolan delves into his realm of genius and cranks out a real piece of quasi-artistic work with his brother. After seeing what Jonah Nolan has done with Memento, The Prestige, and now The Dark Knight, he has risen as one of my favored modern screenwriters. The ways he wraps morbidness, sensibility, and immediacy around a film, especially in his latest Batman work, fumes with pure ingenuity. More importantly, the ways that the Nolan brothers craft a wedge between Gotham's villains out for monetary gain and those thriving on humanity's combustion broods with pitch-black power. Without a truly unforgettable power behind these gears in motion, though, these ideas might have fizzled and not only lost our interest, but possibly felt like a mockery of America's current terrorist hysteria. In steps a lunatic of a man dressed in a plum-colored zoot-suit with white and red facepaint clouding his horrific facial scars, and he couldn't be more perfect for the job. Early on, we witness Heath Ledger's Joker perform a "magic trick". It's a moment that'll stew in my mildly morbid brain for quite some time, as it gave my nerves a bit of electroshock therapy that didn't let up until the credits rolled. Ledger, an Academy-Award nominated actor for his phenomenal work in Brokeback Mountain, completely outdoes his previous efforts as this sadist villain. Literally, you get lost in his unrecognizable and sickly comedic portrayal; I hadn't the foggiest notion what to even process when staring into his psychotic eyes and soaking in his ghastly voice. Ledger's presence in the film is seminal, echoing every ounce of fright that creeps underneath our skin, and wholly deserving of the accolades that it has, and will, garnish. Though the alignment between Batman and his do-gooder counterparts Gordon and Dent radiate with thematic resonance, the stark parallels between our hero and our core villain gives us a conflict of epic proportions. There's so many misfired neuroses and corrupting character quirks that spark between the "psychos from different sides of the traintracks" that it makes this politically-charged film about money concealment and mob power struggles much more resonant. This happens because it harshly dethrones their place in this world to the levels of the scurrying rats that scrounge around a growingly more intimidating and, at times, beautiful city. 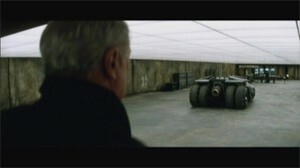 Lacking the sumptuous vistas and such that the first film received its Oscar nomination for in the cinematography category, The Dark Knights aesthetic values still more than trump its predecessor in its industrialist photography filled with architectural complexity and intelligible action sequences. It's clear Nolan learned a lot from assembling his first action film, because, and here's a shocker, Batman can actually be seen brawling this time around instead of as a clippy, sporadic blur! Though the editing was generally solid in Begins, the erratic fight sequences were a headache to process. Not this time around; The Dark Knight flows around the battle sequences, as well as several conversation sequences, with much more fluid steady-cam pans that sweep us into the action. Top that with matching gorgeous shots of the Chicago skyline and a resonant soundtrack, and well ... you've got a masterpiece from its gorgeous outer surface all the way to its dramatically powerful roots. Instead of a comic book film, The Dark Knight instead sits on a bookshelf with the rest of Nolan's pieces of work as a true achievement in cinema. Only with some highly controlled and painstaking nit-picking can I find much fault here. There's some technology integrated within the narrative that requires a few leaps of faith (sonar continuum from the first), but the sheer brilliance flowing from this thematic tour-de-force easily outclasses a little technological inexplicability and, more importantly, begs for your trust in its heartbreakingly bleak resonance. Has Christopher Nolan changed the face of comic book films forever? Not really -- that would limit The Dark Knight's cinematic potency, which it more than slays any stigmas that might have confronted it from the start. Simply, I loved this movie in the same ways that I love great films: because this is an evocative and stunning picture.